‘The Panache’ Chic Boutique-Type Building Located In The Vibrant High Demand Yonge & Eglinton And Mount Pleasant Village Neighbourhoods, Unobstructed View, Granite Counters, Stainless Steel Appliances, Near Fabulous Trendy Shops, Restaurants, Clubs, Schools And TTC At Your Door Step, Was Nominated For Toronto Pug Award For Outstanding Architecture In 2008. Luxury Recreation Facilities With Indoor Pool, Jacuzzi, Sauna, Exercise Room, Visitor Parking, Party Room, Guest Suites, Stainless Steel Fridge, Stove, B/I Microwave, B/I Dishwasher, Washer / Dryer. 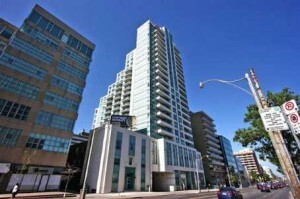 (719 sq ft) 1 bedroom plus den, 1 parking space, unfurnished, $1700/mth. Trademarks owned or controlled by The Canadian Real Estate Association. Used under license. The information provided herein must only be used by consumers that have a bona fide interest in the purchase, sale or lease of real estate and may not be used for any commercial purpose or any other purpose. Information is deemed reliable but is not guaranteed accurate by TREB.